I had a bag of just opened desiccated coconut that was going to expire really soon. Throwing away food makes me feel guilty. I also have a habit of stocking up my pantry with potential food items for baking. From time to time, things are carried away and I end up with food bought months ago but haven’t been touched and reaching their expiry date. This was exactly what happened and I ended up with a whole bag of coconut needs to be used. I was planning to make a few things coconut to try using this up. Things didn’t go quite as planned and I haven’t had chances to make anything coconut yet until now (apart from Cherry Ripe macarons I made weeks ago). One of the things in my mind was coconut bread. S loves coconut bread from the Asian bakery chain, BreadTop, a lot. And so do I. The bread is sweet, buttery and coconutey. It has crumbly almost cake-like texture. The coconut filling sort of spreads inside the bread randomly. It has rich buttery coconut filling and rather sweet. I was trying to replicate this coconut bread, though I wasn’t aiming for something as sweet and buttery (you know, I’m trying to be sensible about the diet where I can). I need a bread shaping technique that would give a random coconut filling throughout the bread interior, and ‘babka’ bread would fit this purpose. To have a buttery moist interior, I was thinking of coconut mixed with butter into a paste and used as filling. When the bread is baked the butter will be absorbed into its crumb and gives moist and buttery crumbs. I never heard of babka before until one of my blog reader pointed out that the chocolate twisted bread I made resembled babka. Babka is Jewish twisted sweet bread, generally with chocolate or cinnamon filling. It is usually made with double layers of twisted dough and topped with streusel. Well, that is the traditional babka, here is my own take on it, a (sort of) coconut babka. My version: only one layer of twisted bread, no chocolate or cinnamon filling, only coconut and butter, no streusel, only egg wash. I used basic sweet bread recipe and made the dough into one babka and six big coconut rolls. Babka was baked in bread tin and rolls were baked in texas muffin tin (an extra large muffin tin). Both turned out to be quite pleasing to the eyes. The aroma of coconut is wonderfully sweet, creamy and toasty. It is one the most aromatic food. My house was filled with heavenly aroma when these breads were being baked. It was the aroma that reminded me of my hometown, Thailand. It felt like I was transported back to Bangkok and was having a coconut pudding or sweets. The bread was really lovely toasted with butter. It was heavenly. We had also had them with vanilla ice cream and poached pears as a dessert (didn’t have the chance to take the photo. It was sinfully good). Mix sugar, yeast, and flour together in a bowl. Pour in the warm milk. Mix until smooth. Cover with plastic bag. Set aside for 30 minutes. You will see a lots of yeast activity in the sponge. There’ll be lots of bubbles and volume will be about double. Add eggs, salt, sugar and half of bread flour (175g) into the sponge. Mix until smooth (using either mixer or a big metal spoon). Mixing on a medium speed with dough hook, add butter to the mixture, a couple of small pieces at a time and beat well to combine. Add the remaining bread flour and mix until combined and butter is well incorporated. Continue kneading on medium speed until the dough is smooth and silky, about 3-5 minutes. Adjusting the flour as necessary to achieve smooth and silky dough. Place the dough in an oiled bowl, cover with plastic bag, and let it rise at room temperature approximately 1 ½ to hours or until doubled in size. At this stage, you can chill the dough overnight or proceed with the below shaping. If chilling the dough overnight, degas the dough before chilling, and follow below instructions on shaping. To shape babka – Grease bread pan. Cut the roll open in the middle. Lay two pieces of dough side by side with the cut side up. Gently twist the two pieces together. 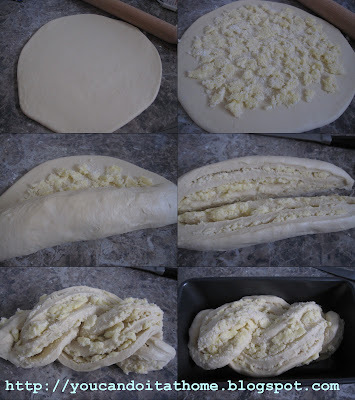 Start from the top, put the left piece on top of the right piece, and continue for the whole dough length. Gently lift the dough into bread pan (my bread pan is 23 x 13 cm). Cover the pan with plastic bag or wrap. Proof the dough at room temperature for 45 - 60 minutes or until almost doubled in size. To shape roll – Cut each jelly roll into 6 equal pieces. 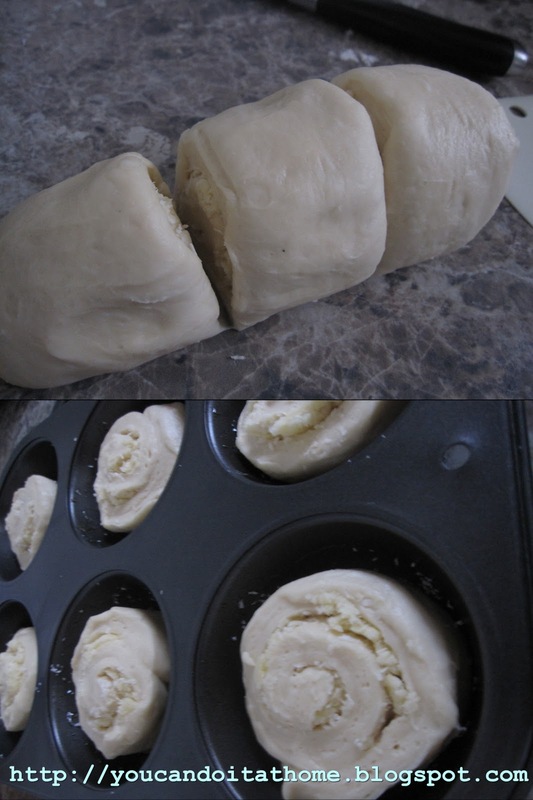 You can put the cut rolls onto texas muffin pan or lay them on baking trays. Cover the pan with plastic bag or wrap. Proof at room temperature for 45 - 60 minutes or until doubled in size. Preheat the oven to 175 c .
Brush the surface of the dough with egg wash (mix egg and milk together to get egg wash) before baking. Baking babka loaf for 35 – 40 minutes. Baking roll for 25 – 30 minutes. Mix butter, coconut and sugar together until well combined. The mixture will become a thick chunky paste. Set aside. Great job Sue! I remembered those Asian Coconut buns from Chinatown in NYC... boy your post sure bought back alot of memories. Thanks so much for sharing your job well done! Thank you LeeYong. That's the thing about food. It makes you feel nostalgic and evokes good memories. Thank you Sandie. Coconut is fabulouse with this bread.